Tonight was my first attempt at making Paella, which is a Spanish dish of saffron rice, combined with a variety of meats and shellfish such as shrimp, lobster, clams, chicken, ham or chorizo. Other ingredients might include garlic, onions, peas, peppers, or tomatoes, and the combination can easily change to use the foods available or to suit your own preference. The inspiration for this dish came from a bag of mixed seafood I found at Trader Joe's. 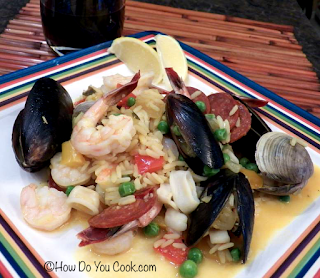 I wanted to do something special with this seafood, not just a simple stir fry, and since I've always wanted to try paella, this was my chance. 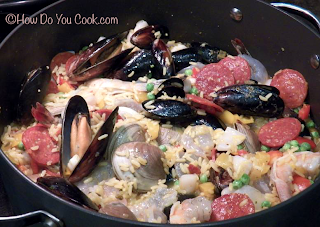 Instead of the traditional paella pan I used my faithful stock pot and it worked out great, no special pan needed. In place of arborio rice and saffron threads, I used a saffron rice mixture, and it was a perfectly seasoned shortcut. I was very surprised at how easy this dish was to prepare, so I'm sure we will be making it again, and I can't wait to try it on the outdoor grill. This is a really fun dish to make and enjoy with guests. There is something for everyone and one thing is for sure, there won't be any leftovers! Enjoy!! Heat oil in a large stock pot or paella pan over medium-high heat. When oil begins to shimmer add the garlic, onion, peppers and chorizo. Cook until vegetables are softened, about 4 minutes. Stir in the rice, broth, paprika, salt and pepper and bring mixture to a boil. Reduce heat, cover, and simmer until about half of the liquid is absorbed, about 10 minutes. Serve the Paella with lemon wedges on the side and a glass of light red Rioja or Chianti wine. Don't you just love the flavors in paella. I enjoy making it when I'm entertaining a group...there is something for everybody. I'm sure yours was a real hit. My little group loved the flavors and I can't wait to make this again. I might need to add extra mussels next time, they were sooo good. Thanks for visiting Karen.